(NaturalNews) We've just posted a Health Ranger Report interview with investigative journalist Jon Rappoport, one of the last remaining honest investigative journalists in America. The full interview is available on YouTube. The interview was recorded right before Dr. Thompson made a public confession of a CDC conspiracy to commit scientific fraud and bury evidence linking MMR vaccines to autism. Dr. Thompson's admission of scientific fraud at the CDC is now a matter of public record, even though the corporate-run media is continuing its total media blackout on the story, condemning countless more African-American babies to vaccine violence while the truth remains hidden. 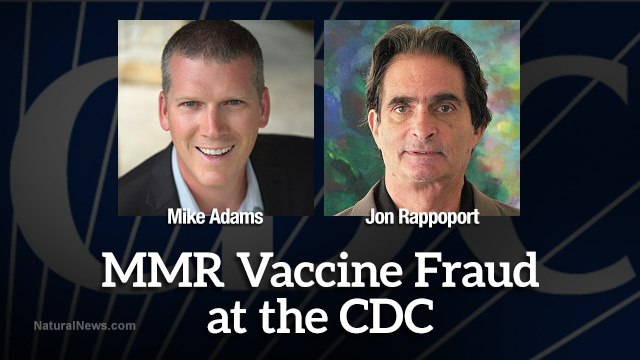 In this interview, I discuss with Rappoport the latest developments in the MMR vaccine fraud revelations, including the widespread media cover-up, the history of U.S. government medical experiments on African-Americans, the criminality of the CDC and its money-laundering scientists, and why the CDC is little more than a regulatory pawn of the vaccine industry. Jon Rappoport also posted a very insightful story about CNN's desperate resorting to serial liars to "defend" MMR vaccines and lie to the public about their safety. Yesterday, CNN published an article about CDC whistleblower William Thompson. The day before yesterday, Thompson confessed that he and other CDC coauthors fabricated a 2004 CDC study, in order to hide an MMR-vaccine connection to autism. Those other co-authors included Dr. Frank DeStefano. DeStefano was the lead author of the 2004 study. So naturally... CNN goes to DeStefano for a quote defending the safety of vaccines, and De Stefano, the accused liar, tells another lie without blushing, without missing a beat. "We know the brain and cellular features for children begin when the child is still in the womb. The brain is already developing the wiring that will manifest in autism." In other words, according to DeStefano, vaccines couldn't cause autism, because it's already forming before the child has ever had a vaccine. If that were true, why bother to do thousands of studies that allege there is no vaccine-autism connection? DeStefano is lying. If he had proof -- brain-scan pictures -- that show autism forming in the womb, the world would have seen them by now. Those pictures would be front and center in the DSM, the official bible of mental disorders. Those pictures, in fact, would be the diagnostic test that confirms the presence of autism. But guess what? If you go to the DSM and the definition of autism, you will find no defining diagnostic tests. No brain scans. No pictures. No blood test. No urine test. No genetic assay. Frank DeStefano is a liar. DeStefano is a very important serial liar at the CDC. He isn't just a liar who lied in the 2004 study that exonerated the MMR vaccine. He has authored work exonerating mercury in vaccines. And DeStefano isn't just an author. No. He happens to be, since 2004, when he lied about the MMR vaccine, the Acting Chief of the CDC's Immunization Safety Branch of the National Immunization Program. DeStefano is The Man when it comes to vaccine safety. The Lying Man. He is in charge of other liars. Good work, CNN. You're upholding your reputation as the most trusted name in serial lying.